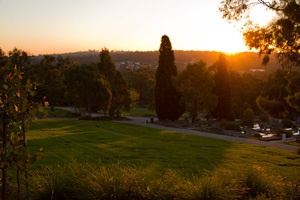 Eltham Cemetery provides a natural environment of tranquility, where the living and the deceased are able to be at peace; where contemplation and celebration of life may be experienced. The services that the Eltham Cemetery provides are efficiently performed with an awareness and respect shown to its natural setting. The cemetery will be available to the community of Eltham for any purpose not in conflict with the primary purpose of presenting a tranquil and serene resting place.